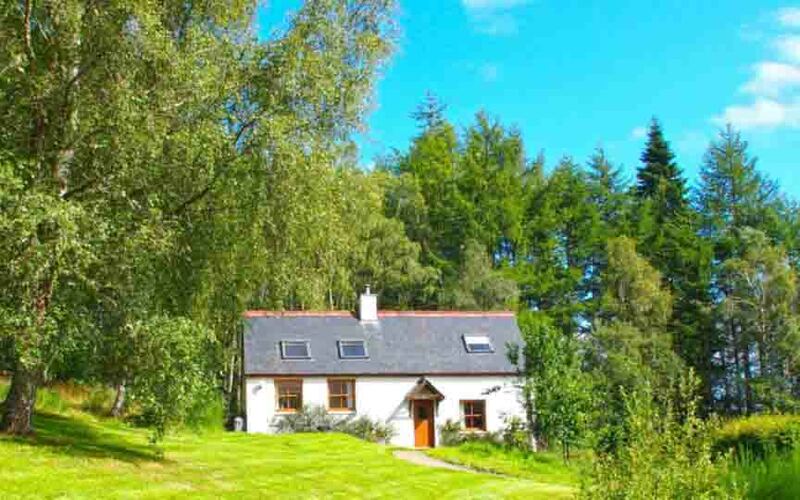 Set in an elevated position above the river Beauly, our woodland cottages provide an idyllic retreat amongst some of the Scottish Highland's most spectacular scenery. Nestled in the midst of three of the most beautiful Scottish Glens – Glen Affric, Glen Cannich and Glen Strathfarrar – you will be on the doorstep to some of the wilder and most remote areas of Scotland whilst still within easy reach of the capital of the Highlands, Inverness. Our two cottages sit well apart from each other, secluded within 4 acres of woodland and gardens bordered by a small burn to the East. Once here you can either retreat from it all and enjoy the tranquil magic of this place or use it as a base to explore the Highland wilderness that is on your doorstep. Alternatively you can visit the more well known attractions of the area such as Loch Ness. So whether you are looking for a romantic break, a special place to “get away from it all” or pursue outdoor activities like hill-walking, fishing, pony trekking or watching the local wildlife our cottages offer an ideal spot for your holiday. "A lovely cosy cottage in a beautiful location"
This is a bright and modern cottage with an open plan layout including a mezzanine area, yet still having the charm of a log burning stove and beautiful views. "Heavenly is the best way I can describe my stay. The cottage is cozy and perfect...."